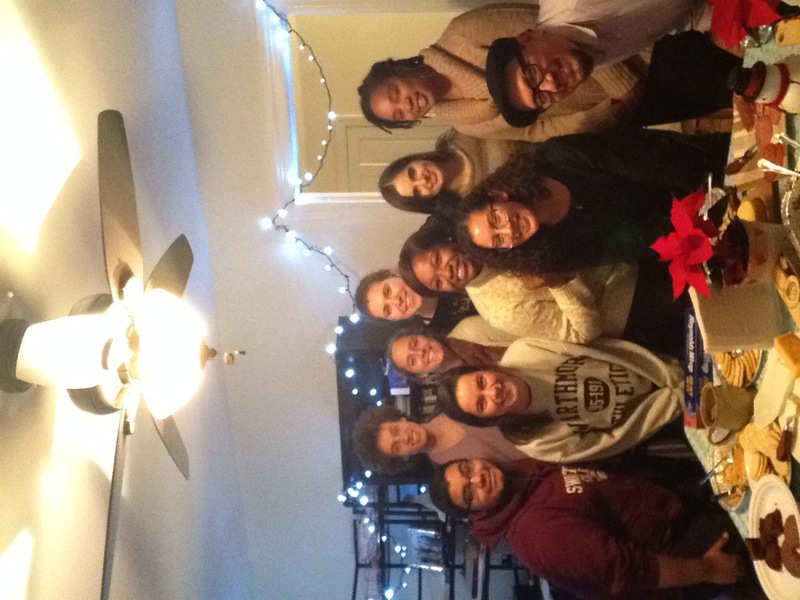 As my first semester here at Swarthmore is coming to an end, I had the great opportunity of having students from my #TeacherLives course come over for a potluck dinner this evening. What a wonderful group of human beings they are. It has been an honor to be called their teacher. I would not have reached this point in my own life without the support of my family, and in particular my father, Luis Enrique Mayorga. Today marks six months since he went on to the other side, and there is not a day that goes by that I think of him. I hear him in my own voice when I wake Teo up in the morning (a levantarse señor). I think of him when work is piling up and the end is not in sight (a meterle mano). 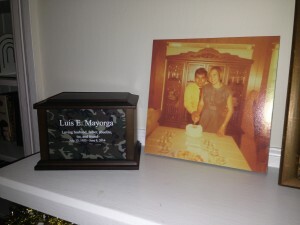 In memory of my father, I wanted to share the eulogy I wrote for him. I also post the slide show of pictures we put together for him during his memorial in June. Finally, today is when John Lennon died in 1980. My father turned me on to the Beatles and John Lennon, so I share Imagine here. My father was not always a hopeful man, but the hope that he did have he enlivened through us, his children. I do hope you are well, wherever you may be. 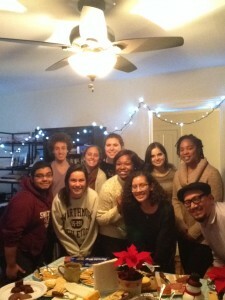 Please know that I’ve been really fortunate to work with some really amazing students. You would have liked getting to know them. We are all thinking of you, and keep you close to us. Good afternoon, buenas tardes. Welcome, bienvenidos. I’m Edwin Mayorga and this is my sister Tamarah Mayorga. We, along with our mother, Maria Elena Mayorga, our sister, Milena Doss, our brother, Mauricio Centeno, our partners Jennifer Lee and Raul Ogaz, our children Melissa Macedo, Desiree Macedo, Teo Mayorga, and grandchildren Maya Bueno and Micah Macedo, want to thank you for joining us today to celebrate the life of our father, step father, father in law, abuelito, Luis Enrique Mayorga. We want to thank everyone for your messages of love and support over the last week. We are particularly grateful to our tio Marlon Mayorga and his family, tia Eufemia; cousins Jessica, Marlon, Paul and Kevin; partners Bianca, Edna, and Krystal; nieces/nephew Mylee, Zoe, and Kellen, for being there with us over the last week. We want to thank the bible study group that my parents were a part of, and whose members have so generously brought us lunches and dinners in recent days to help sustain us through this difficult time. Finally I want to thank Guerra y Gutierrez mortuary for hosting us this afternoon. And Presbyterian intercommunity hospital of Whittier for caring for our father in his last week with us on this earth. but he loves the country where he is born. but should leave traces of his time. No one can avoid their responsibility. be mute and cut off their own hands. We all have a duty of love to fulfill. 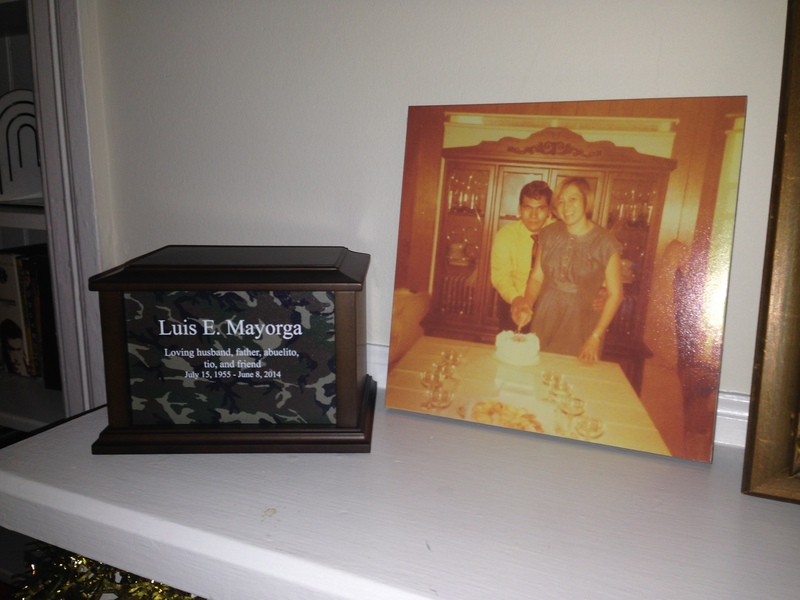 Luis Enrique Mayorga was born on July 15, 1955 in Leon, Nicaragua to his parents Salvador Mayorga and Esperanza Palma Mayorga. raised in Managua, Nicaragua He would immigrate to the United States in 1974 at the ripe age of 19 and would marry Maria Elena Chang in October of 1975. He peacefully passed on Sunday, June 8, 2014 at 11:53 pm. He was surrounded by members of his immediate family, his brother, Marlon Mayorga’s, family and friends. My father possessed, like all human beings, many flaws and strengths, but he was always a hero to me. I remember vividly drawing him in uniform in a school assignment when I was in first or second grade and I wrote next to the drawing that I wanted to be a soldier, just like my dad. Dad WAS a soldier he enlisted in the US Army in 1977 and he would spend the next 11 years in both active duty and in the army reserve. He would end his military service as a Staff Sergeant (at the rank of E-6). But in retrospect I think of him more as a warrior. There is a distinction, for me, between soldier and warrior. The soldier is a trained and paid member of an organization designed to participate in battle, conversely the warrior participates in battles that are familial, moral, intellectual, and spiritual over the course of a life time. Dad was engaged in struggles long after he left the armed forces. His battles were of the mind and the spirit, dealing with a failing a body, facing the realities of poverty and navigating the psychological and emotional challenges that these hardships had wrought on him and his family. He may have ultimately lost the war with his body, but it is this warrior/guerrero spirit, a will to luchar, to fight, to struggle, that will continue on. This spirit was the seed that our father brought with him into the world, the seed he gave birth to and grew each and everyday. It was this warrior spirit that gave him the strength to immigrate to a new country as a teenager. Never physically returning to Nicaragua after the 1970s, he forged a new life with my mother, her two children, and later my sister and myself. Still he did not forget his beloved home country and the memories he had of growing up there. It was this warrior spirit that kept him engaged in being a learner and an intellectual. Mom remembers dad always being in school, whether it be when he was majoring in political science at cal state LA, or learning to build computers at the local adult education center, participating in bible study, or having late night philosophical conversations with his kids, my dad was always engaged in a life of the mind. He would be part of PTAs, school field trips, school and after school events. He would partake in advocating for us and for our schoolmates in order to ensure that we had sufficient resources. On the day to day. He would graciously give rides to us and our friends to make sure we all got home safely. Upon hearing of his passing, many of my friends would express condolences and remember my father and his warm and boisterous presence at so many different events. He was never afraid to have a good conversation with anyone. It was this warrior spirit that would get him in trouble at work or social service agencies. Dad was always ready for a battle, and I have many memories of angry phone calls and the receiver being slammed down to hang up on someone dad disagreed with. Hey, like I said earlier he had strengths and flaws. Still, this helped him ensure that he and his family would have the resources we had rights to. We were poor but dad, with mom at his side, would find ways to find what we needed to have comfortable and enriched lives. Sometimes that would require some hard fought battles. It was this warrior spirit that made even having fun an intense process. We live in a place where Disneyland, Knott’s Berry farm, Sea World, and Las Vegas, were just a short drive, or senior bus rides, away, so my dad loved taking us, or himself, to places when we could afford it. He seemed to get a particular kick out of surprising us with these short trips and goin’ hard all day. I remember vividly going to Laughlin, Nevada one long weekend. Toward the end of the weekend, my dad, walking along with the cane he would walk with for most of his life said, in all seriousness and enthusiasm, “so where should we go next when we get back” being the teenager who now dreaded going anywhere with his family, and having been drained by the current trip, said, can we just stay home? Dad was insulted, I think because I had taken the air out of his ballon. Still he just kept right on planning. Kept right on moving. The trips would grow fewer and farther between, but each time it was an intense adventure. I think in the end it was this warrior spirit that would help him live as long as he did. He would live with the polymyositis for nearly 30 years, defying the initial prognosis that he would live for three years at most. Let’s be clear, life was never easy, and there were many days where he did not feel like going on, but he endured. He endured primarily for us, his children and his wife, his family, and for that we thank you dad. It was your ability to endure, filled our lives with a lot of highs and lows that influenced deeply who we all are. Dad, we miss you, but we seek solace in knowing that you will be able to rest peacefully now. We hope to continue carrying on your warrior spirit through our own lives and the lives of our children. Please know you are always with us.